Ok, it hasn’t been “frightful” here, but the weather has certainly been less than “delightful”, as the song goes, especially for the Bahamas. 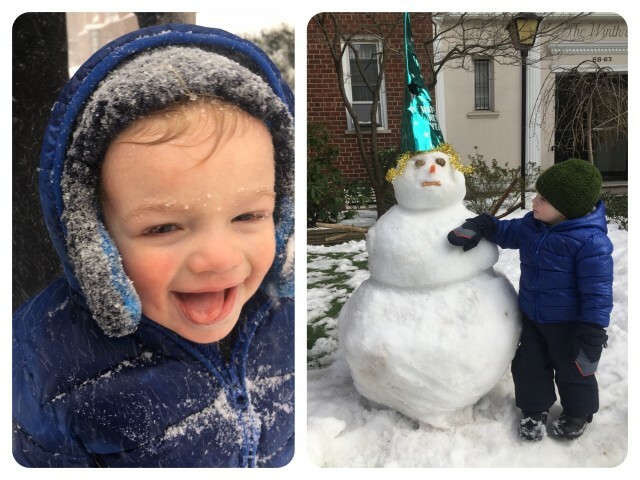 Our families up north in Delaware, Pennsylvania, New York City, and Connecticut experienced the first real winter snowstorm last weekend. I’ll admit that I felt a bit wistful as I looked at the photos of the snow. That first snowfall is so beautiful. Especially with precious grandchildren playing it it! 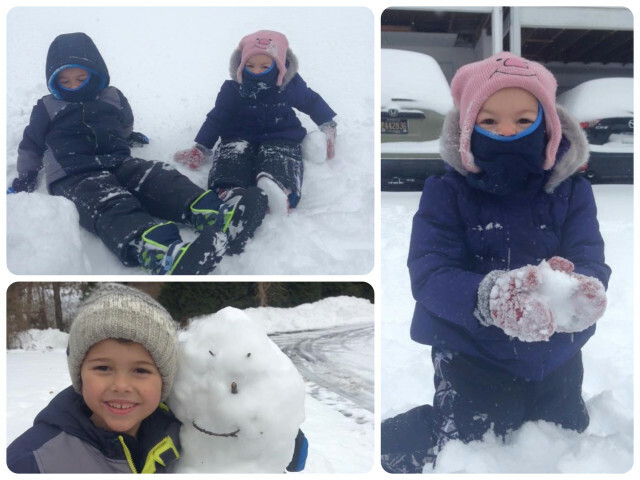 Aaron (6 years old) and Ella ( 2 1/2 years old) enjoying their big snow fall in Delaware. Caleb, 20 months old, discovered he really likes snow, all 26 inches of it in New York City. 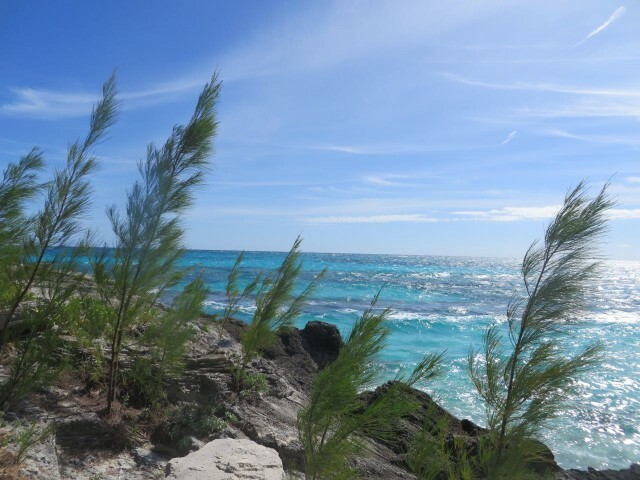 For most of the month of January, we have had the Bahama version of “winter” – very windy, cool temperatures in the high 60s/low 70s, and more clouds than sunshine. Each week brought us several fronts with only 24-36 hours of a good weather window, if that. 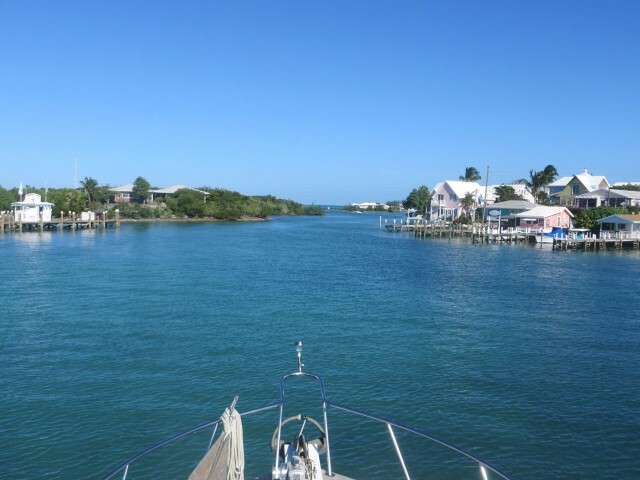 Since January began, we have only left Hope Town harbor a few times, two day trips (Fowl Cay National Park & Man O’ War), two race days, and one trip to Marsh Harbor for an overnight grocery run. 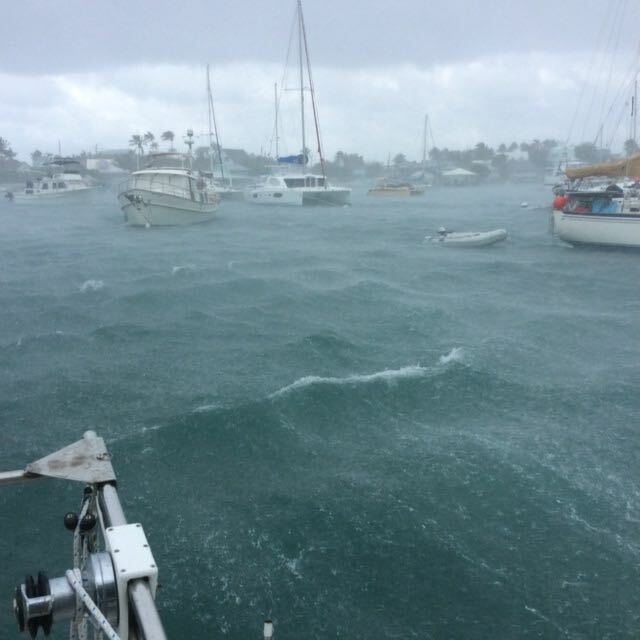 We haven’t even taken the dinghy out for a snorkeling trip. BUT, we aren’t really complaining. On the other hand, what do we do when we can’t swim in the blue water or play on the sandy beaches?? Just like we would do at home as dirt dwellers, we socialize, do our chores, and make the best of the hours of good weather when it happens. 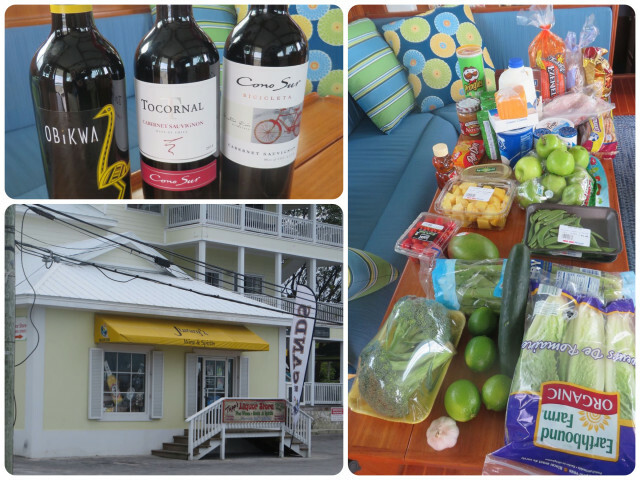 An organized BIG Happy Hour at the Inn and Marina’s pool. Lots and lots of delicious food, much more than “happy hour snacks”, and a chance for everyone to get together in one place. Notice the long sleeves and jackets? It was a very cool evening. 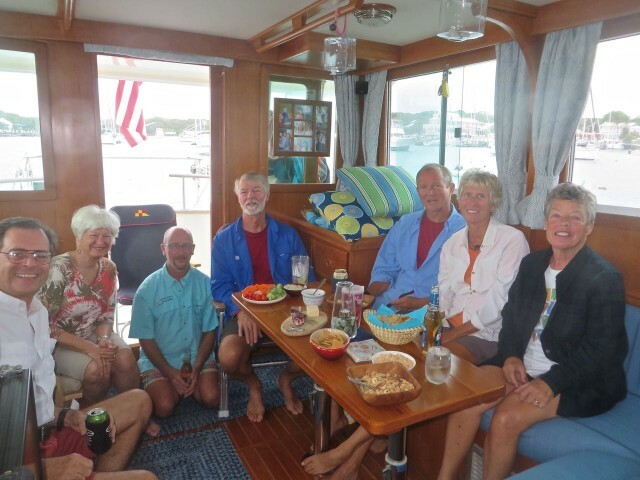 We hosted a few smaller happy hours on Kindred Spirit. 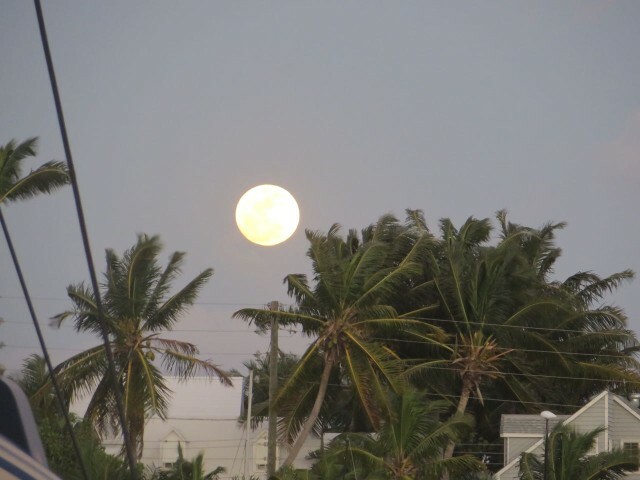 Our only look at January’s full moon was on the day before it became full. Too much cloud cover on the 24th. The full moon tides brought higher and lower tides than typical. 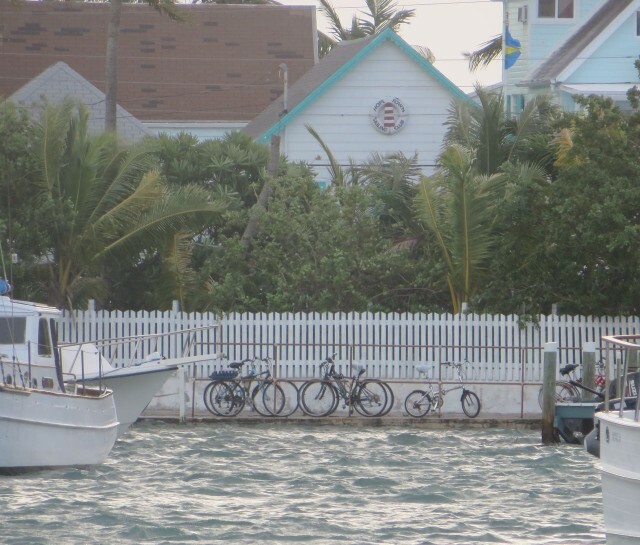 From the deck of Kindred Spirit we could see our bicycles (middle pair) on land – it almost looked like they were sitting on the water. Five of us decided to walk the beach to On Da Beach for lunch on a every windy Sunday. On Da Beach is a cool beach side bar and grill. A great way to spend the afternoon! Not a bad day for a beach walk at all, but notice the long sleeves again on everyone. Marcia and Muffin walking ahead. Al and Dan behind us. 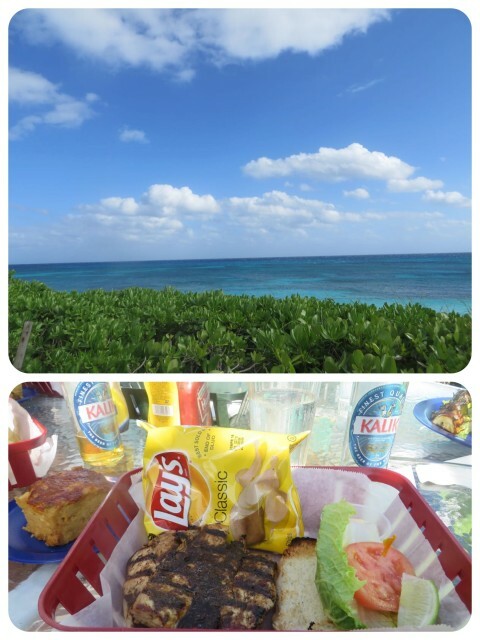 On Da Beach has a great view of the ocean and great food – grilled Mahi Mahi and Bahamian mac and cheese! And Kaliks, naturally. Whoopee! A slightly calmer day was predicted. Not enough time to get away for a couple of days, but enough time to make a grocery run over to Marsh Harbour. The compass on our GPS and autopilot needed calibrating, again. They did not agree at all. While we leisurely made our way to Marsh Harbour, we decided to put it through its paces again with a nice long stretch of open water to make our triple 360 degree circles per the autopilot’s instructions. Humph. Didn’t seem to improve it at all. 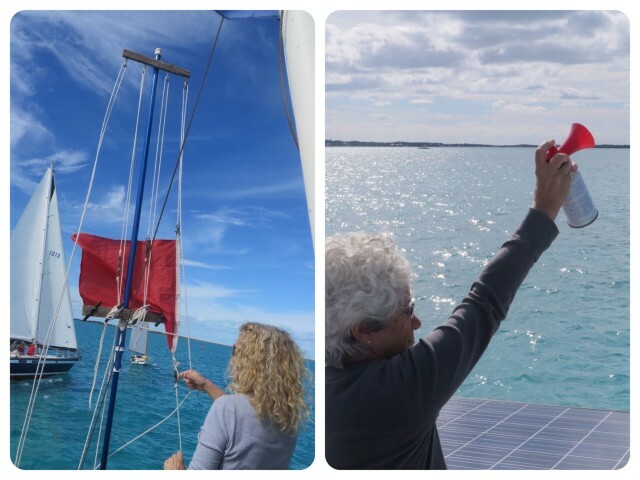 Good news – The next day, the two compass readings were closer than ever before. Is this like restarting your computing after an update? Shopping time! At Jimmy’s you can buy three bottles of decent red wine for $18. Other cruisers told us about the “Obiwan Kenobi” red wine. AKA Obikwa. Or, as the owner told us, “Obama” wine. The right picture is $130 worth of groceries. I try not to look at the food prices any more. 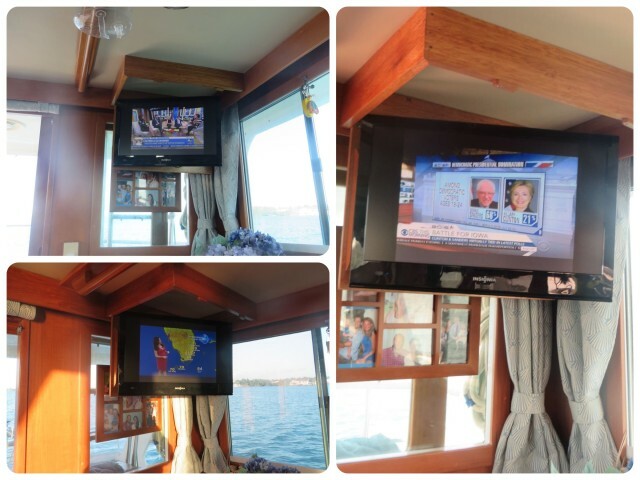 Much to our surprise, we had really good tv reception in Marsh Harbour!! First time on the entire trip, since September . We enjoyed the morning news as we had breakfast and coffee, but soon learned that tv is still tv. The Florida weather girl is pregnant, the presidential campaigns continue, and the talking heads are still …..talking. Al has had his eye on the doors for some time. Most of the exterior teak varnish had disappeared before we purchased the boat, leaving the beautiful ( to us) natural gray color. The doors were peeling and were on Al’s to-do list. He decided that while we were hanging out in Marsh Harbour it would be a great time to sand one. Off the door came. Into the dinghy it went. 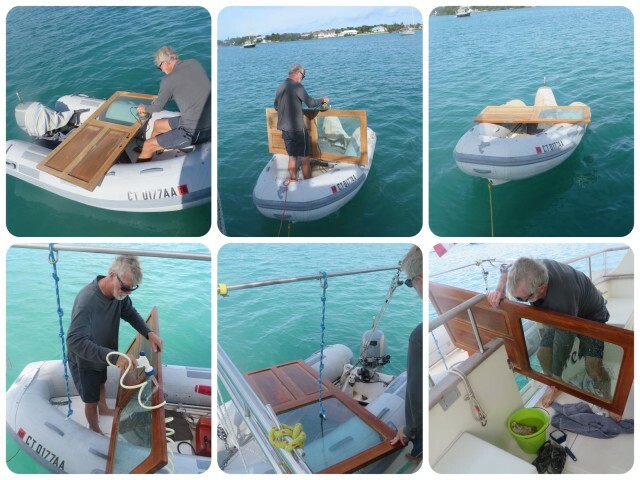 Al’s latest project – sanding the starboard door. He used his power sander which meant that the generator was running and the power cord extended from the boat out to the dinghy. I held my breath the whole time. He seems to know what he he is doing except when asked what is the next step for this door? The answer, “I don’t know.” OK.
We did find time for beach combing, adding to our collection of sea glass, small shells, coral, and even a few new sea beans. The photos are from different days. One day the sand stretches out before you , and on another day it can be covered in seaweed. Al has found a variety of “drift seeds”, mostly known as sea beans. He is a true beach comber. 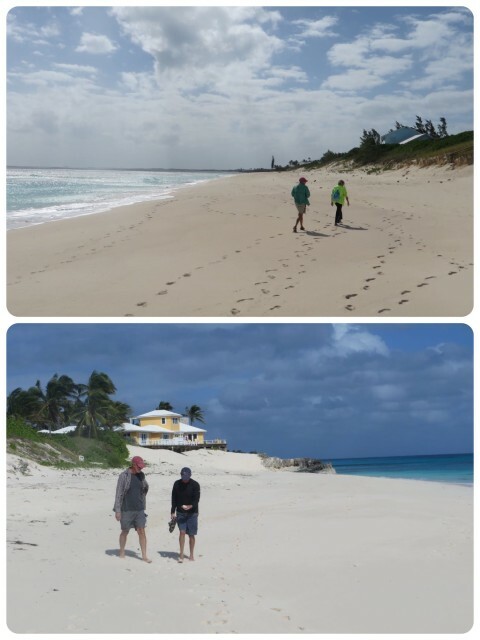 The sea heart on the left was found on Green Turtle Cay when we first arrived. This week he found the spherical shaped ones on Church Beach. 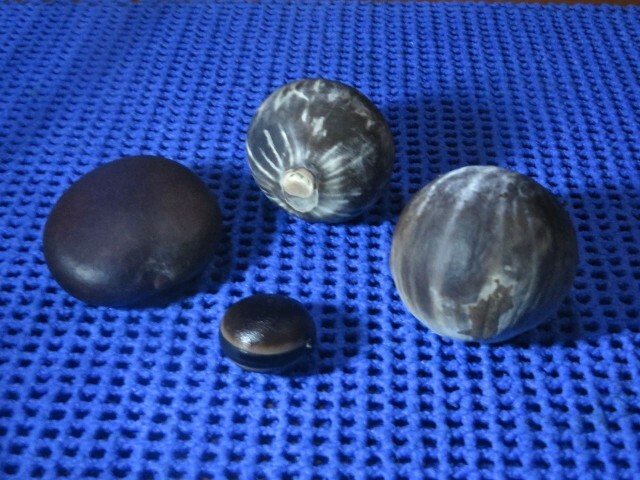 They are c “sea coconuts”, but are not coconuts. The sea coconut is the seed of a tropical palm called the sleeve palm, busso palm, or troolie palm which grows in the Amazon basin, on the island of Trinidad, and on the Caribbean coasts of Central and northern South America, according to Perry and Dennis in their book Sea-Beans From the Tropics. The little one in the foreground is a “hamburger sea bean.” A lovely little specimen. Eventually, Al will polish them all so they acquire a nice sheen. I hope. Slip sliding away……. 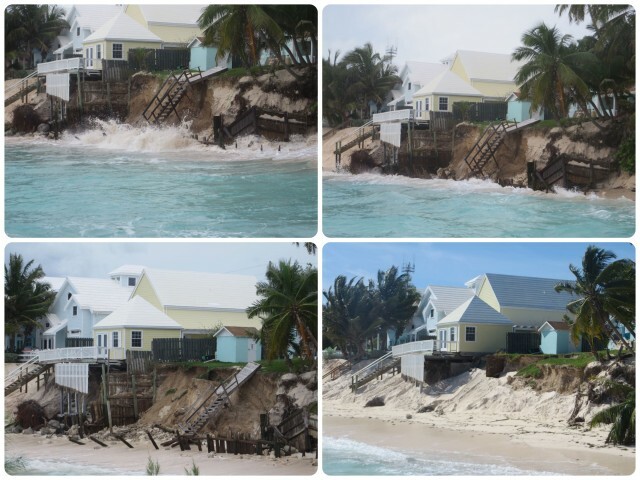 just south of Eastpoint near Church Beach, the winds and waves are eroding the sandy cliff. Over the period of just a few weeks you can see what Mother Nature is taking away, and man is trying to put sand back. Overlooking the ocean from East Point. There may be winds, there may be rains, there may be clouds; but it still beautiful here. 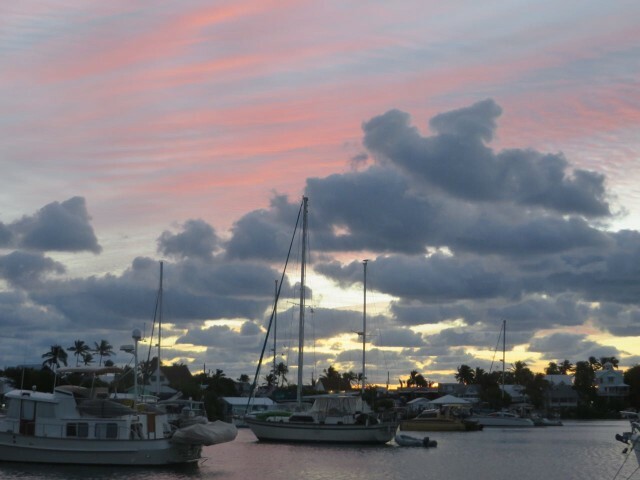 A beautiful dawn in Hope Town. 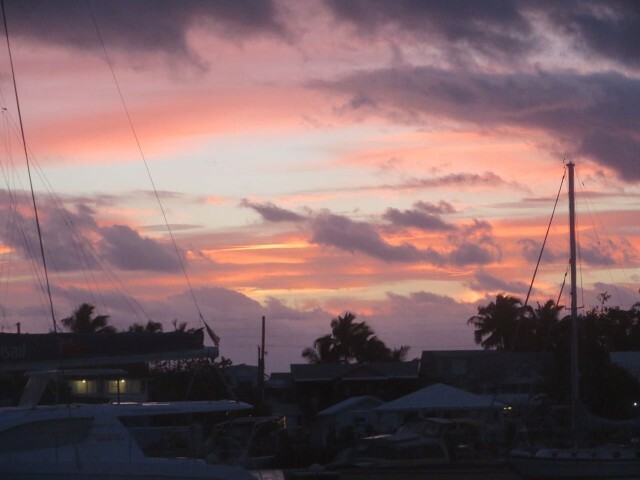 Another glowing sky just before the sun rises over Elbow Cay. 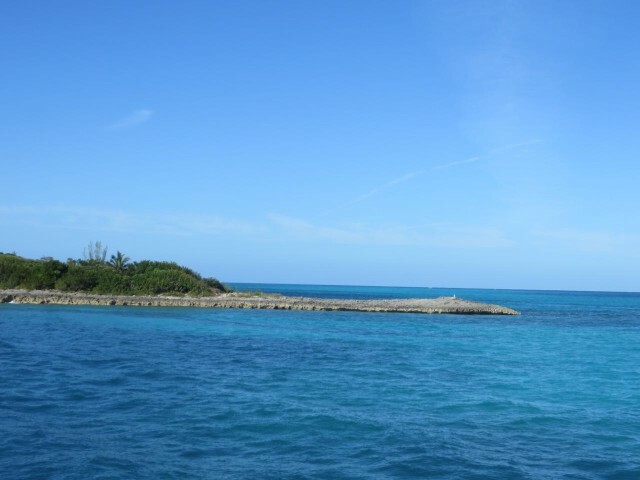 When the sun shines, there is nothing quite as beautiful as the blue skies and the blue waters of the Bahamas. We never get tired of it. 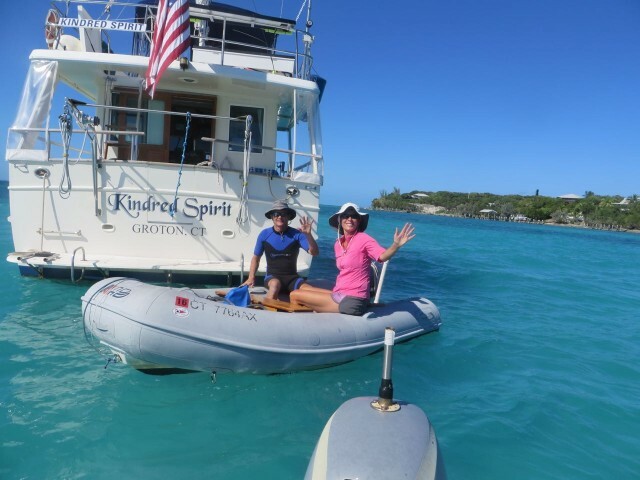 We volunteered Kindred Spirit to serve as the Race Committee boat for one of the Hope Town Sailing Club’s “big boat” races. “Big boat” meaning 18 feet or longer, as opposed to the dinghy and sunfish races. 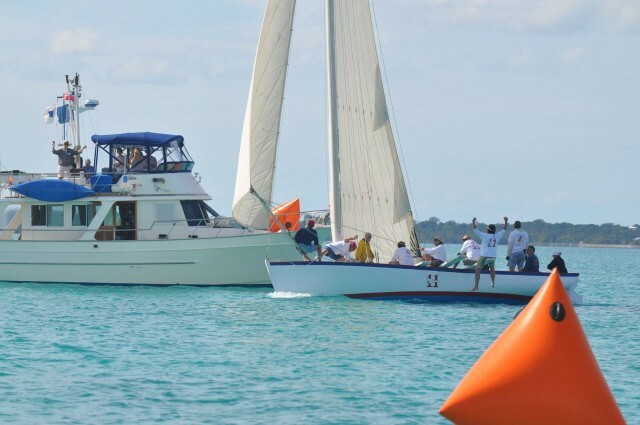 The Charles P. Manchee Trophy Race was held on Wednesday, January 20th. As a trawler, we may not be eligible for racing any longer, but she has the potential to be a really good committee boat. Always looking for a new experience! 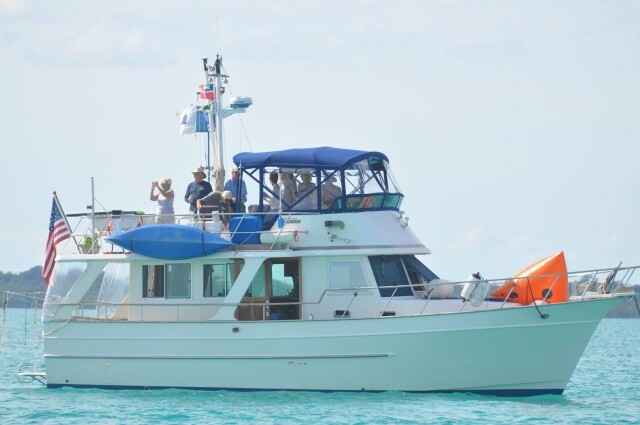 Although the race wouldn’t officially begin until 11:00 am, the committee boat (us) went in to the dock at 8:45 am to pick up the equipment and the six race committee members. 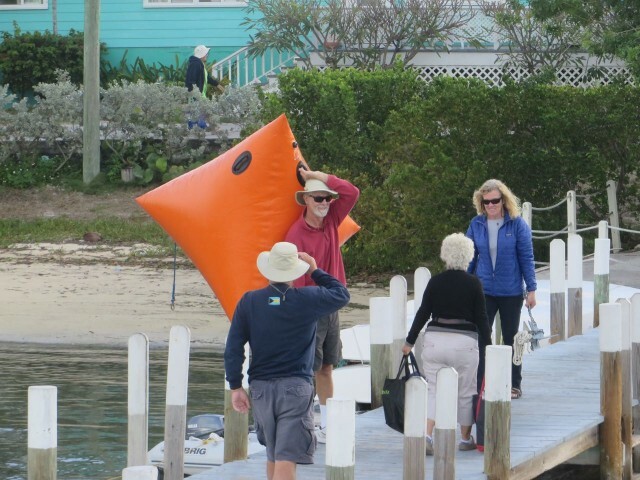 Al is carrying the orange inflatable tetrahedron “mark” out to Kindred Spirit. 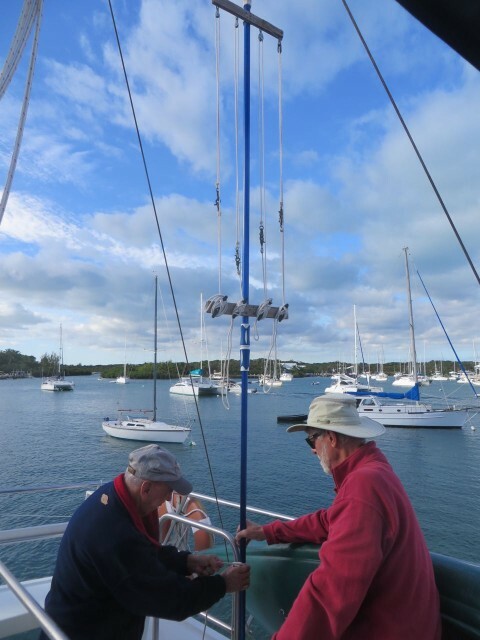 Paul and Al are attaching the race flag staff system to our flybridge. Kindred Spirit at the dock, ready to carry the Race Committee out to the course area. The committee boat heads out to set up the course a good 90 minutes before the start of the race. 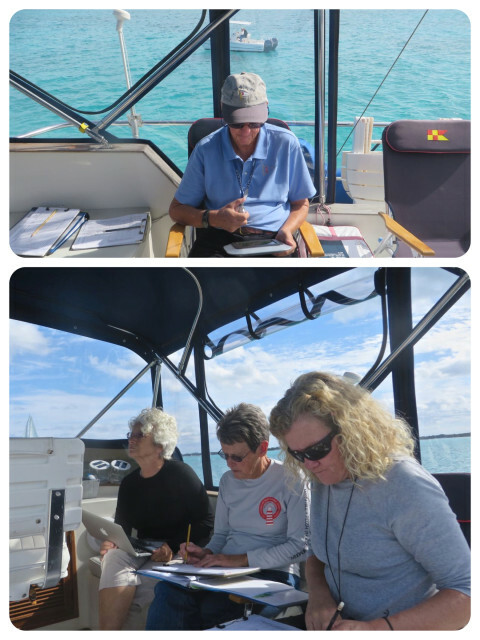 While some of the Race Committee members recorded competitors’ information (boat names, type, length, captains, PHRF rating), others determined where to set the marks. 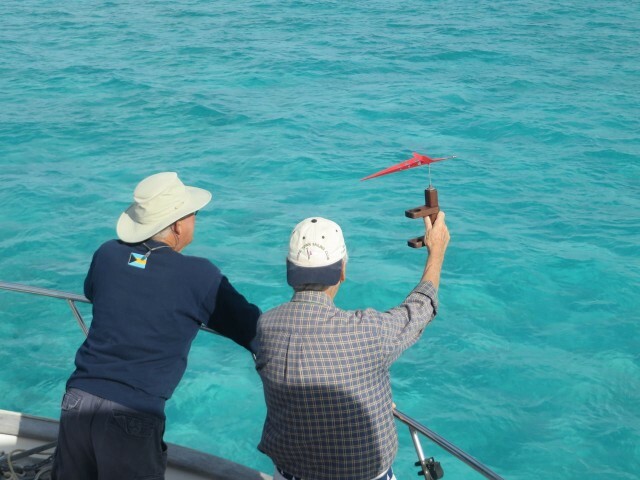 David and John are checking the wind in order to place the start line and the windward mark. This race was a “Point-To-Point Race” rather than around marks set in a triangular course. Below is our iPad Garmin Bluechart record. 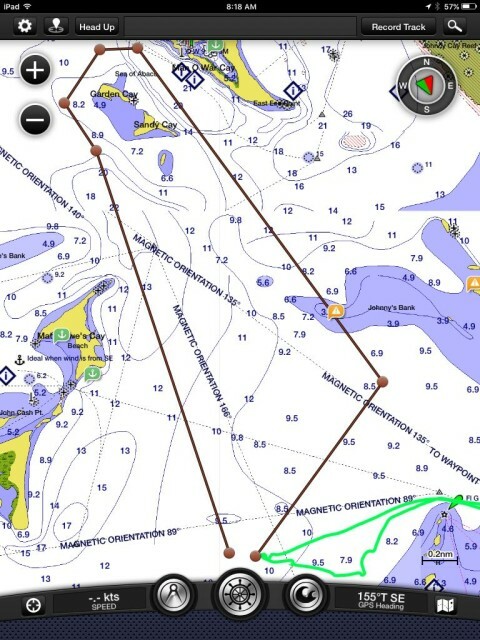 The green squiggling line is the actual course of Kindred Spirit as she left Hope Town harbor and set the starting line. You can tell that one mark was set and then pulled up and moved for a better position. The brown straighter lines are a “recreation” of what we think the actual course was. 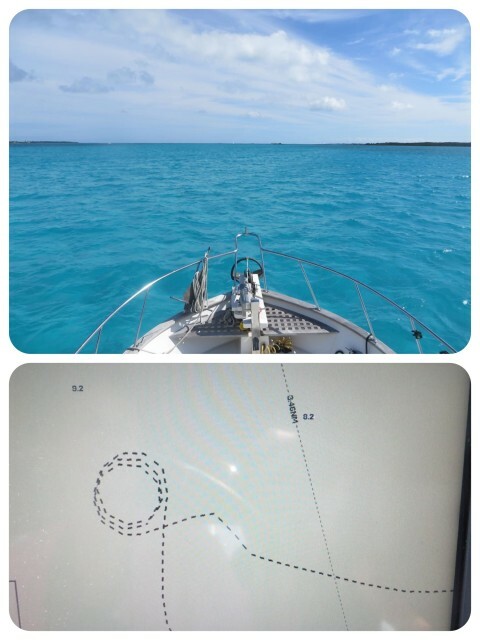 The start would be west of the Parrot Cays (bottom of the screen), around a windward mark near Johnny’s Bank, north of Gardener and Sandy Cays (off of Man O’ War Cay) back to the location of the start mark, and then back to the windward mark for the finish. (I think that’s how to describe it, but I might be wrong). A start line for a running race is painted on the ground. That’s not possible for a sailing race. Instead, the start is an imaginary line between a buoy at one end and the mast of a committee boat at the opposite end of the line. At the start “gun” the competing boats want to be just behind the line and sailing at full speed. Timing this accurately can be challenging for even the most experienced racers. 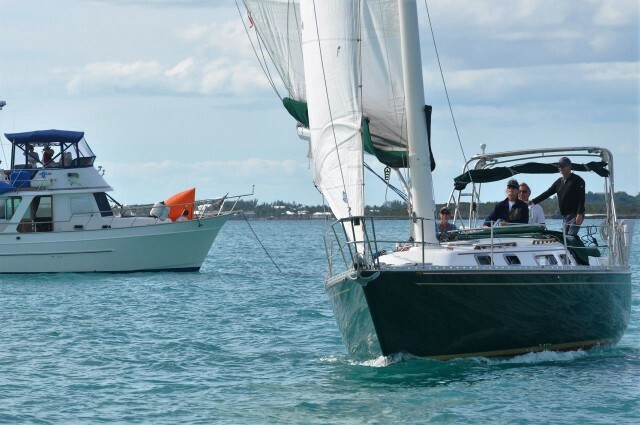 If a boat goes over the start line before the gun, the penalty is to go around and come through the start again before continuing to sail the first leg of the course. 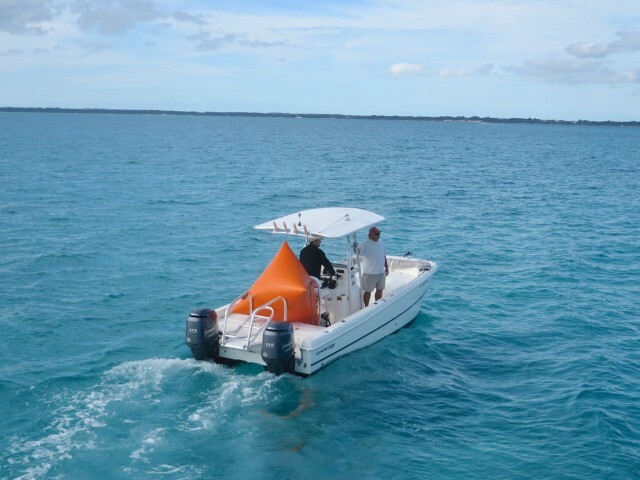 The “mark boat” carries and sets the orange floating marks. Will and Mark (yes, his name is really Mark) head off to do just that. 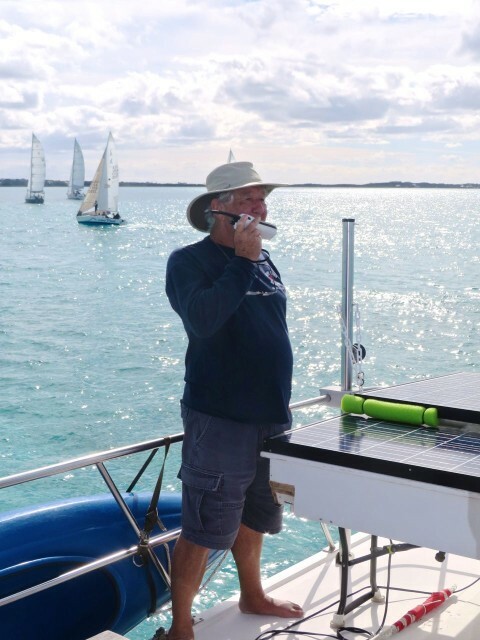 David speaks to the racing boats on the VHF radio. 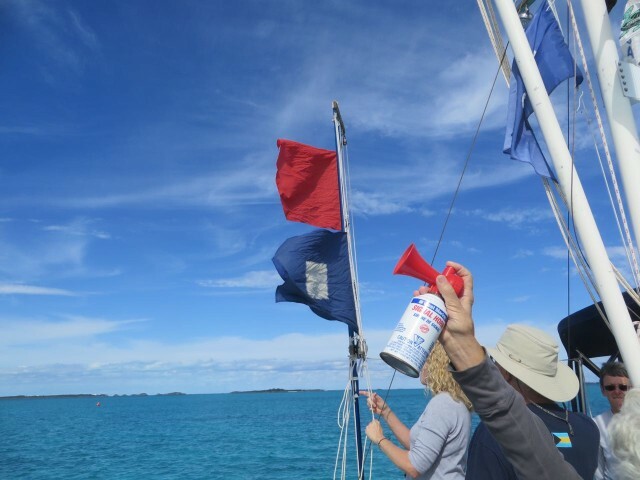 Flags combined with sound signals are used to communicate to the racing boats. Technically it is the flag that signals the exact time because the sound can take several seconds to reach the far end of along start line. Not a problem for this race. To be honest, most of the time when we race, we don’t really pay attention to the hoisting of the flag. We make sure our stopwatch is accurate and pay attention to that, as well as the sound. 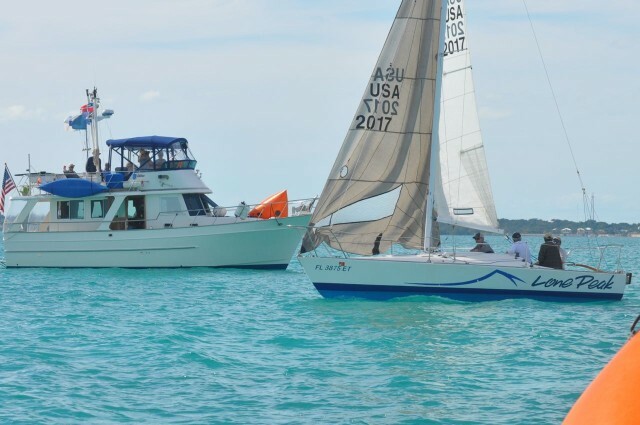 We are usually too busy keeping an eye out for the other boats near the starting line to bother looking out for a flag as well. The starting line can be a pretty exciting place when everyone is jockeying for a good position. I found the flag process for the start of the race very interesting to observe. 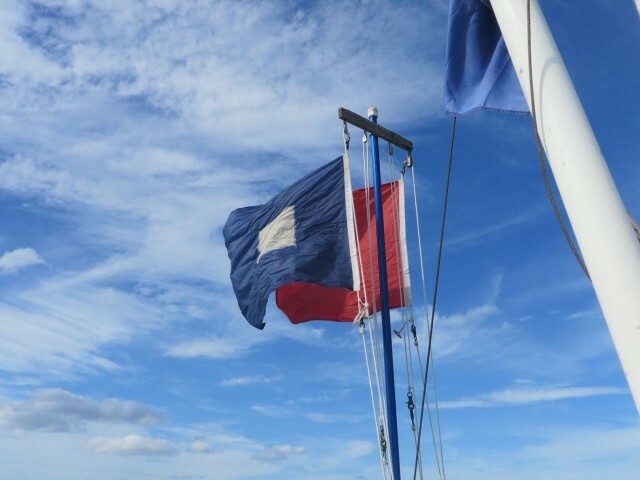 At the four-minute mark, the preparatory “P” flag is hoisted to join the red flag. At the one minute mark, the P flag is removed. At the zero minute, the official start to the race, the red flag is pulled down by Denise as Catherine sounds the horn. The race begins! The boats cross the starting line. 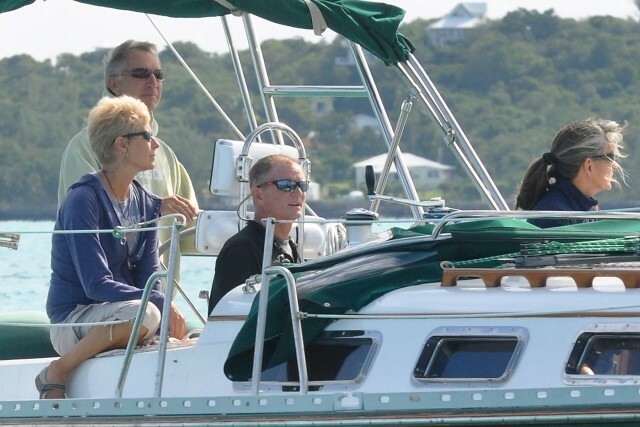 Our flybridge is a very good vantage point to observe the boats. Sam and Kayda, decided to race Solstice again. 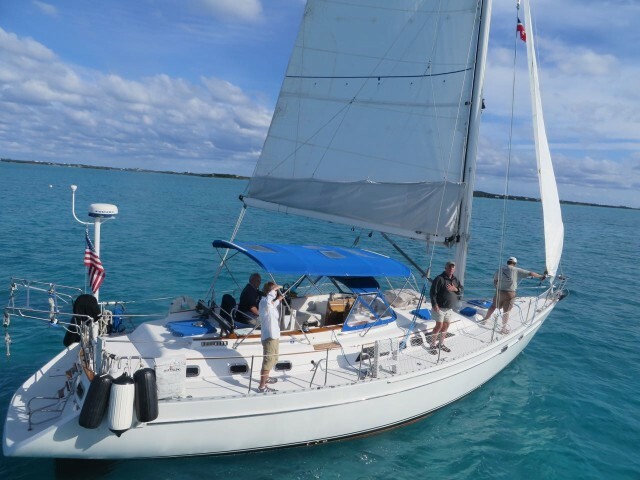 Dan and Marcia crewed on Sea Bean, Rick and LouAnn’s new Freedom 38. Of the 14 boats that began this race, only nine finished. Five “retired.” There just wasn’t much wind, and we sure know what that is like. Things were moving along slooowly. We learned that there is a lot of waiting on the committee boat. With a point-to-point race, we couldn’t see much of the action except for the start and the finish. 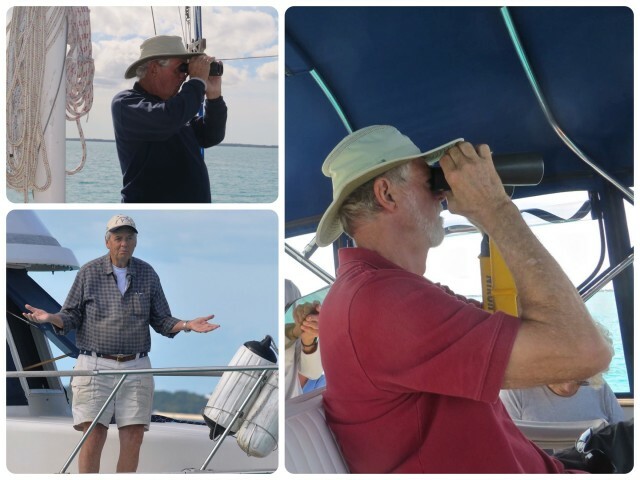 David watching the boats, Al watching the boats, John …….???? 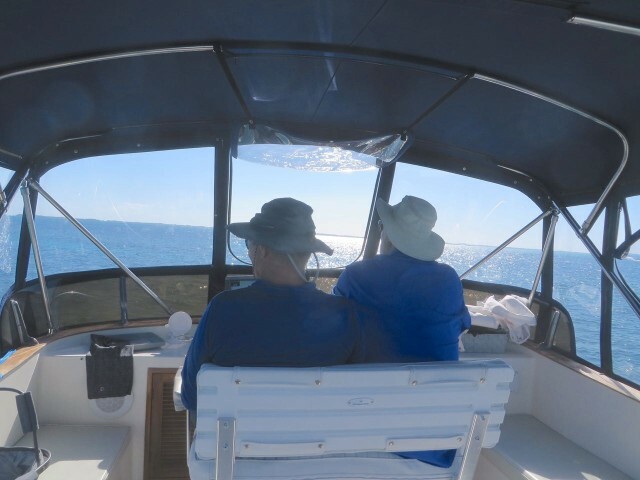 David and Al hanging out on the bow. Waiting and watching. Notice that you can’t even see any racing boats at this point, or any wind. The mark boat moseyed over while we all wait. Hi Will and Mark! 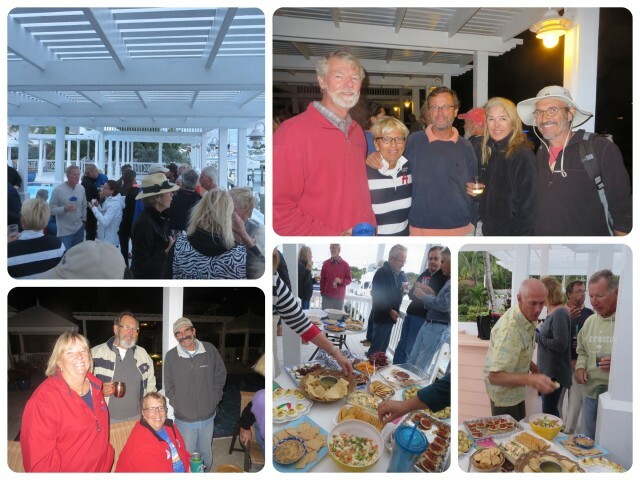 The Race Committee conferred and made the decision to shorten the course due to the very light winds. It’s fun to eat lunch during the race, but no one really wanted to have dinner out there, too. The S flag (S for shortening?) 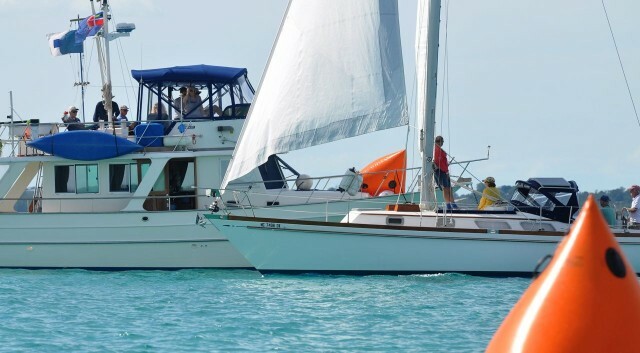 was hoisted to signal that the course had been shortened to end at the start instead of including a final leg back to the mark near Johnny’s Cay. 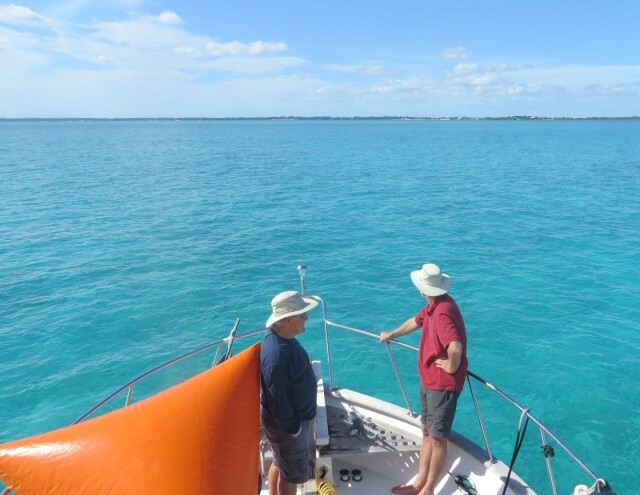 The horn was sounded and David also informed the boats on the VHF radio. 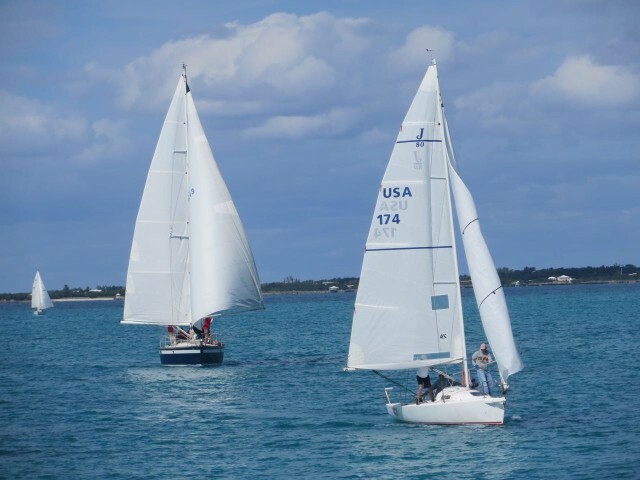 As boats crossed the finish line, the calculating and recording of times, and place with PHRF rating figured in, begins. Paul has the atomic clock for the exact times. Catherine uses her spreadsheet for the calculating and recording of finishes, while Anne and Denise work on the paper record sheets. Grumpy Ole Men and Second Wind head towards the finish line, wing on wing in a final downwind leg. Barquita crosses the finish line. This is a good photo to “see” the imaginary finish line. Lone Peak about to cross the finish line. 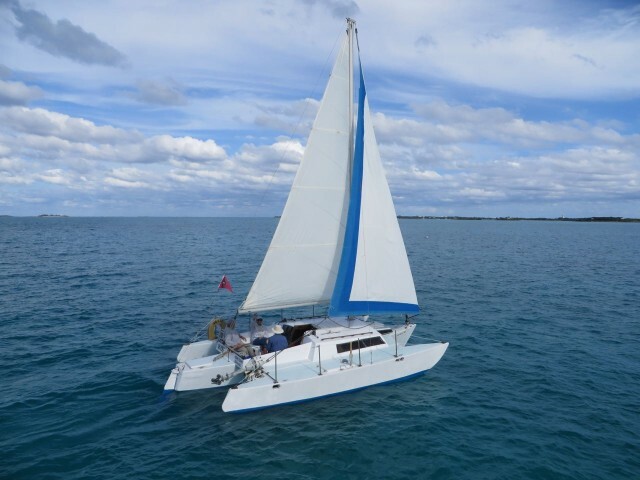 Quest, a trimaran, has finished the race. A good view of Bumblebee from our flybridge as she finishes the race. The conditions and course for this race were very different from the previous race (Sailing Again! 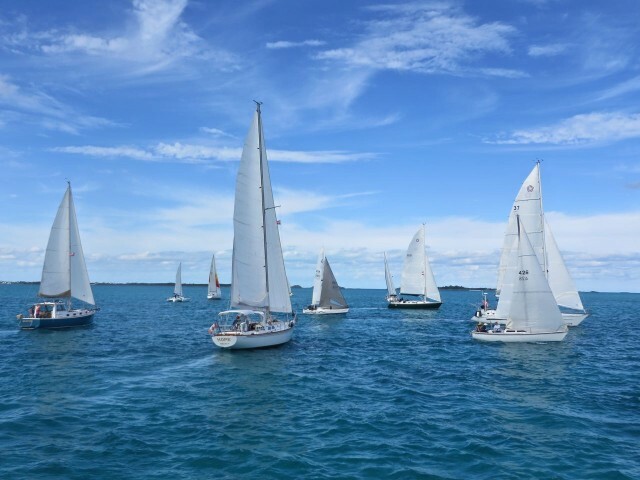 )The very light winds made it difficult for some boats to finish and five “retired” from the race. 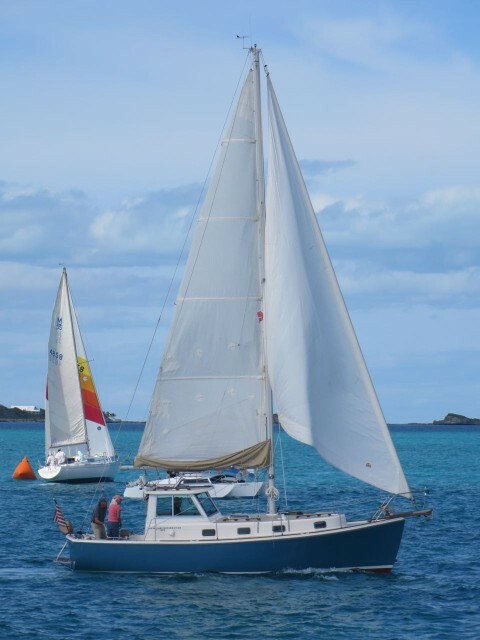 Two boats came too close to the shallows when rounding the windward mark and bumped bottom, briefly. The final results were quite different from the last race. Just goes to show that a race can be anyone’s depending on the conditions, the strategy, the captain and crew, and some good old-fashioned luck. 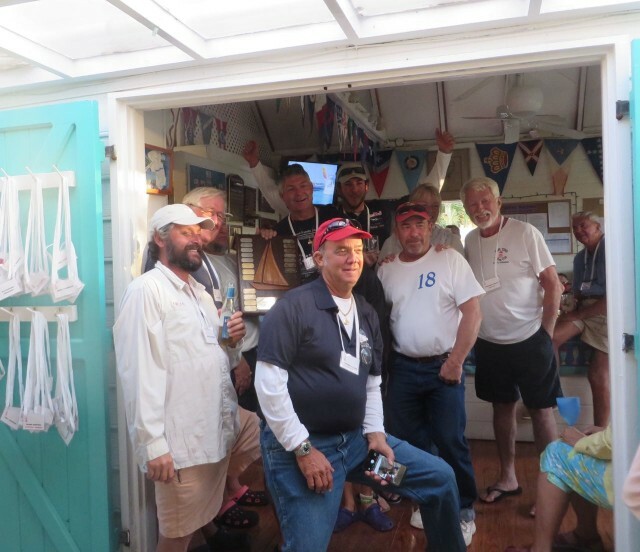 The Rage’s very happy crew with Captain Stafford Patterson, as they receive their first place honors. Job well done! 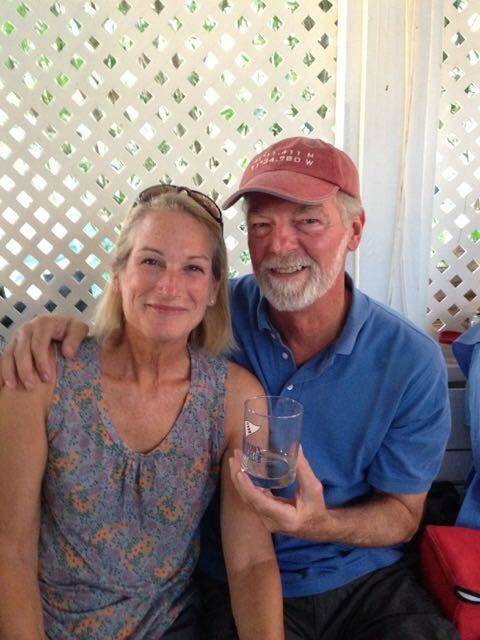 Much to our surprise (and delight) we received a Hope Town Sailing Club glass for serving as the committee boat. Final thoughts — We had a great time and are happy to have participated in the race in this way. 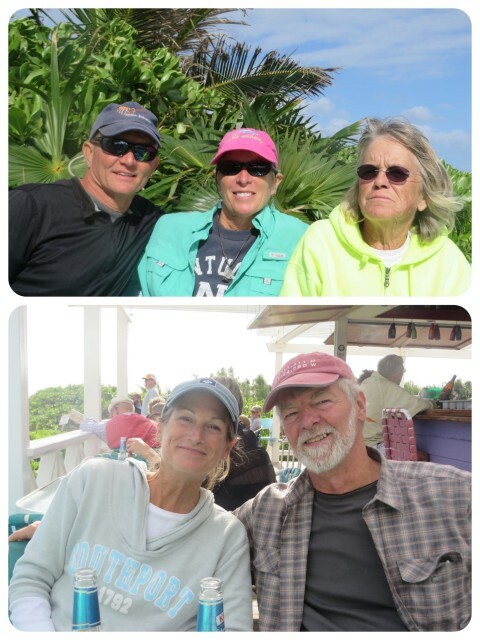 We met some really wonderful people, had a new experience, and were out on the water. What more can you want? One more addition to this post: Two days after the race, I saw this video on the Hope Town Bulletin Facebook page. It automatically began to play and within the first second of the 6-second video, I caught a glimpse of Kindred Spirit. I can tell it was race day because of the bright orange tetrahedron on the bow! Paul Ingram posted it. I have no idea who he is or why, but it was quite a surprise to see our boat. 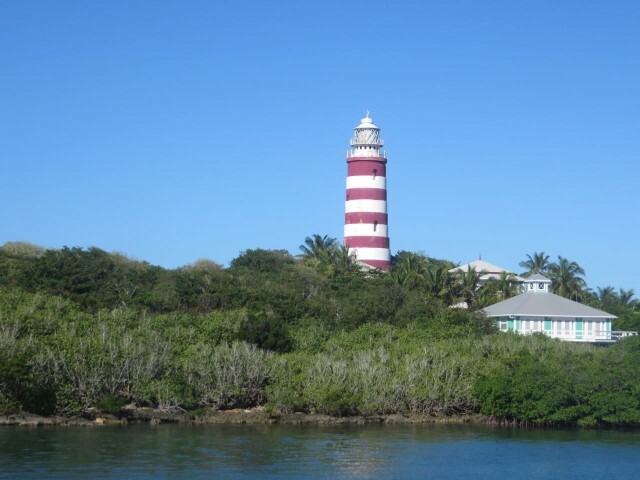 It’s no secret that the weather this winter here in the Bahamas is not up to the standard we experienced during our first trip. Too windy, too cloudy, sometimes even too rainy. 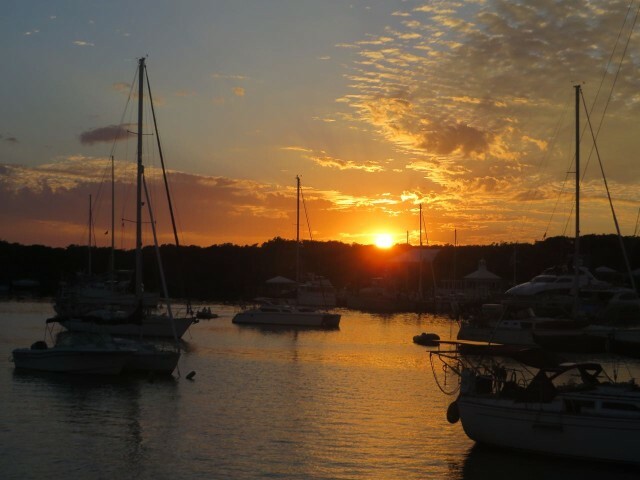 We haven’t been able to leave the harbor or snorkel for the last two weeks. 🙁 But we have been able to walk about town, bike, and visit with friends. And read…. and read. Ahhh, but the weather forecast predicted a beautiful day for Saturday, January 16th, the only day for perhaps yet another week (really??) We needed to get out of town, even if only for one day. Don’t get me wrong, I LOVE Hope Town, but a change of scene would be so nice. 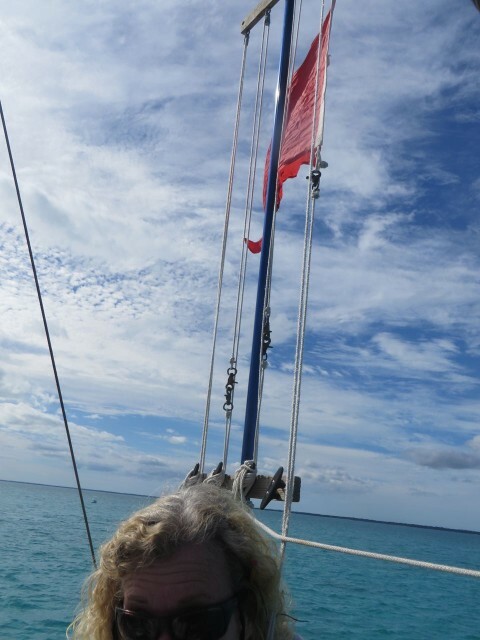 With Dan and Marcia onboard and their dinghy tied to Kindred Spirit, off we went to Man O’ War. Close enough for a day trip, but away and out of the harbor. 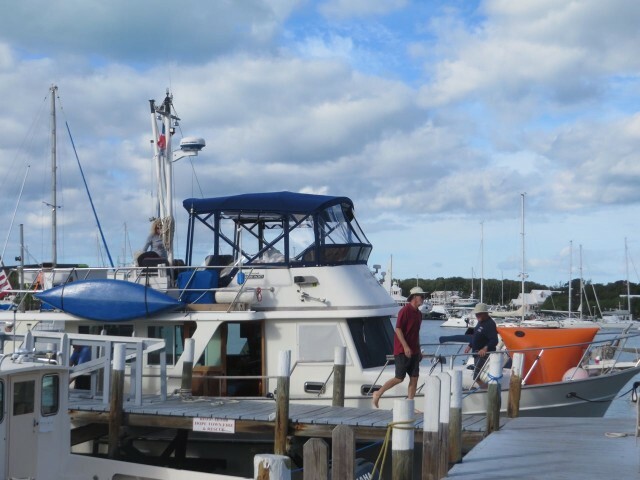 Leaving Hope Town harbor – just look at that totally blue sky! 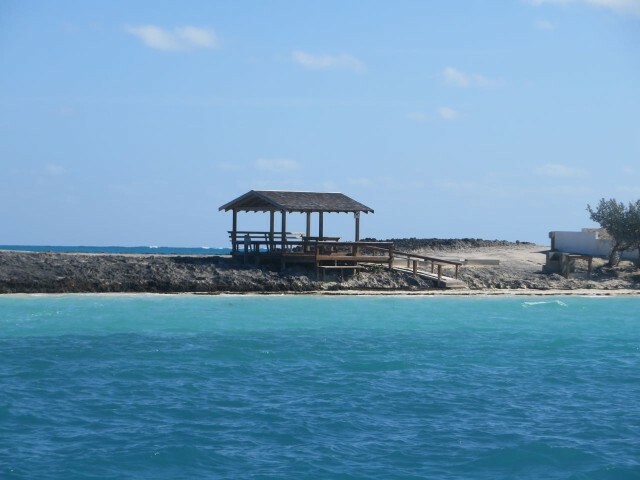 See you later, Elbow Reef Lighthouse! Dan and Al at the helm. 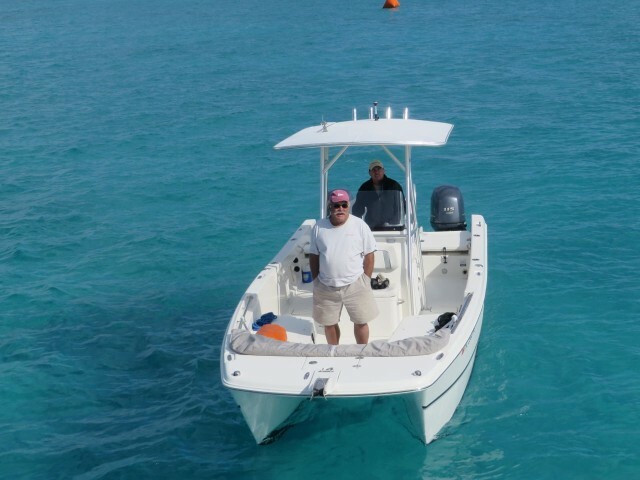 Dan gets a taste of trawler traveling. We anchored in this little cove north of the main harbor. There is a great view of the Atlantic from that wooden pavilion. 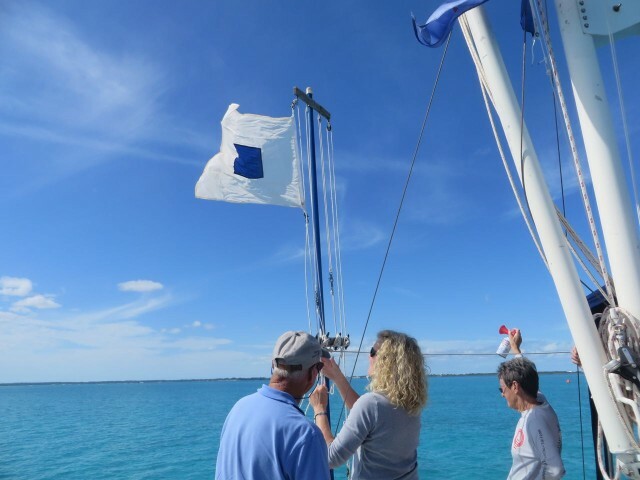 I have often photographed the pirate flag that flies on the little reef off Man O’War, and wondered about it. Who puts it there? Who replaces it when it becomes all worn and tattered? Imagine my surprise to see a different flag flying today, for the first time. There has to be a story behind this. 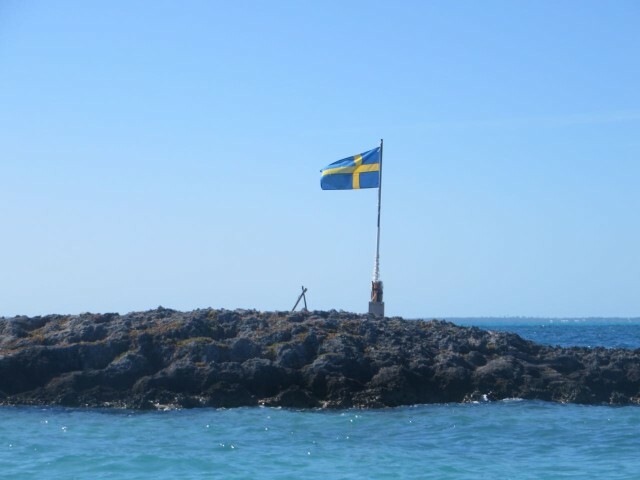 Sure looks like the Swedish flag to me. Perhaps Magnus and Charlotte on Swede Dreams staked a claim? Dan and Marcia off to search for lobsters, of course! 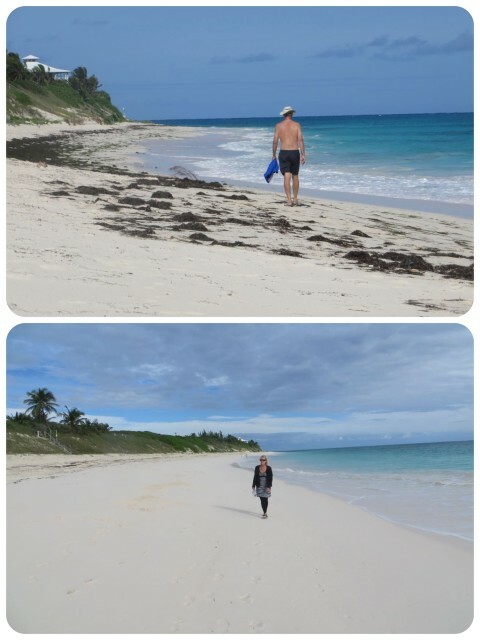 While Dan and Marcia went off to hunt for lobster, we took our dink in to walk around Man O’ War. I don’t recall ever noticing this before when we have walked around Man O’War. 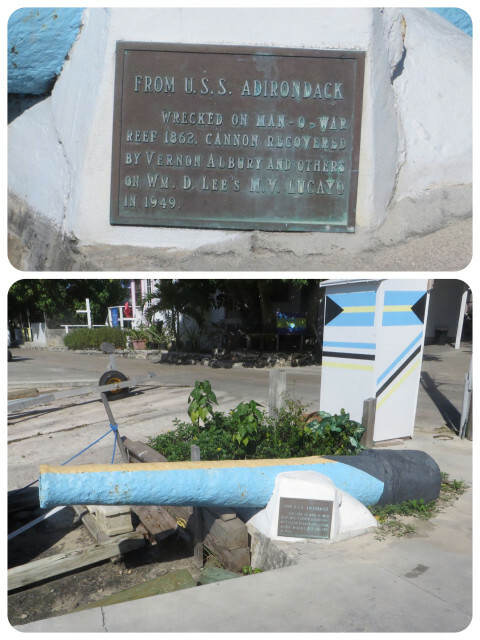 An 1862, cannon painted with Bahama flag colors, and recovered in 1949. 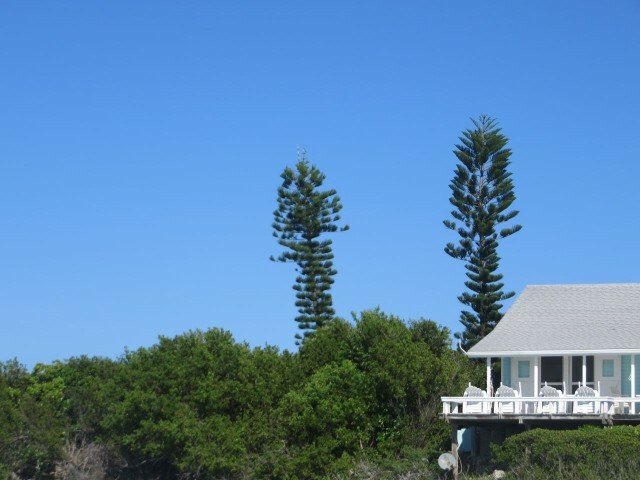 Funny evergreens. When I first saw these in the islands, I didn’t think they were real. They almost look like camouflaged cellular towers. 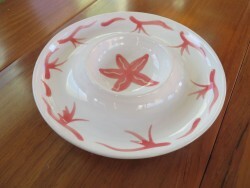 My new appetizer dish — small enough to store on the boat, pretty enough to serve for parties. I was searching for a dish that another cruiser had brought to a happy hour, and found a similar one in a Joe’s Studio here on Man O’ War. I always prefer blues and greens, but the only one there was coral with a starfish motif. I liked it enough to get it! Back to our boat, and it was time for a swim and snorkel. 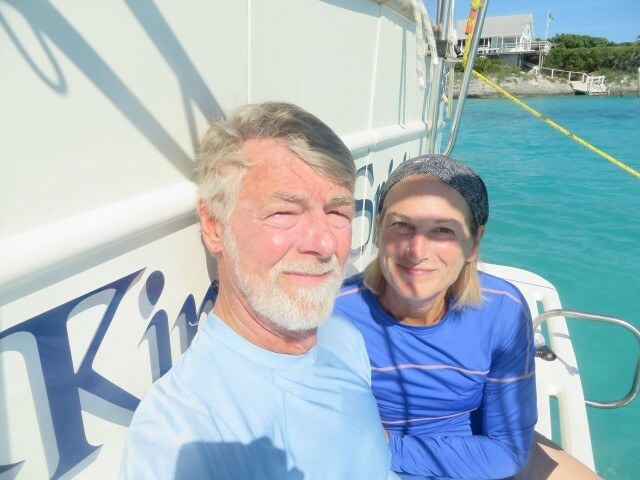 A selfie on the transom before we dive into the water. Al’s eyes aren’t accustomed to this bright sunshine. Al found several starfish and brought them to the surface for me to see. 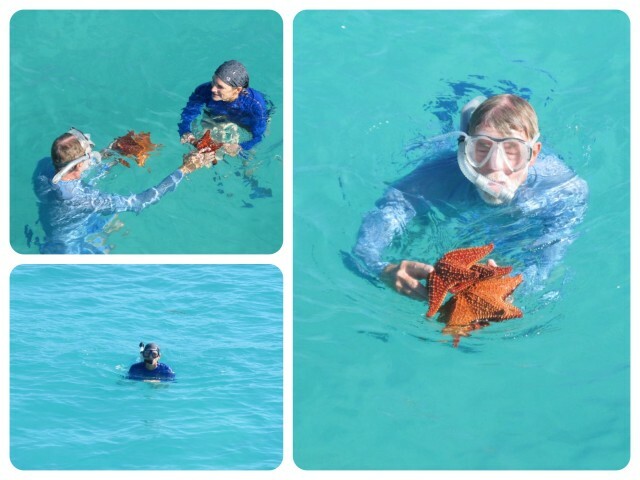 After a photo op, the stars were gently returned to their underwater homes. 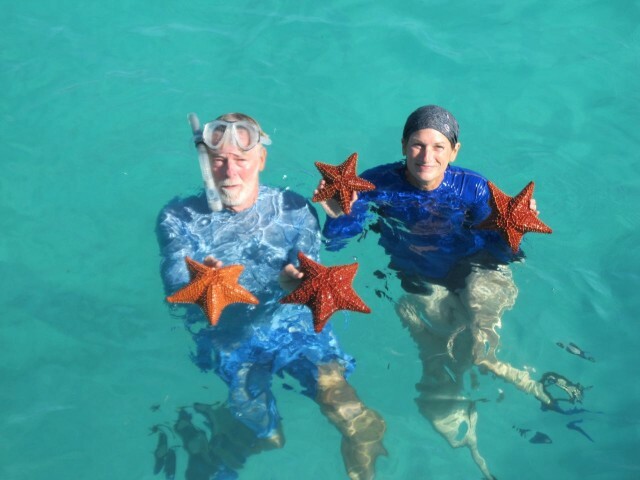 The “star” theme for the day continued – A 4-STARfish day, indeed. We moved down to south Man O’ War passage where things were calm but the current was moving very swiftly, out. 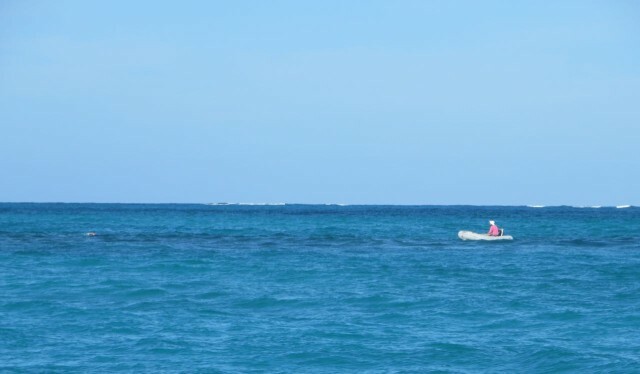 Marcia patiently waited for Dan while he searched for more lobsters, again with no luck. 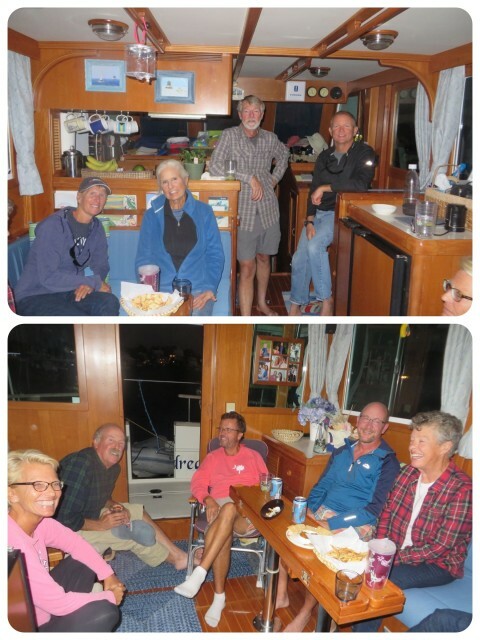 The four of us enjoyed drinks and snacks on the flybridge and watched the sun set. 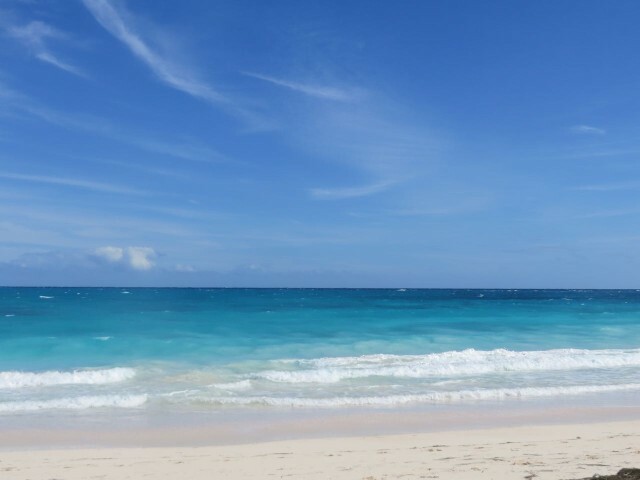 All in all, a 4-star day, spending time under the calm blue skies. The day deserved 4 stars as the single best day in a two week time period. We heard that Sunday was bringing some very strong winds. It’s going to blow a houlie! And it did. The winds blew fiercely under sunny skies for about 4 hours. I heard gusts of 58 reported. The last hour brought the rains. Click on the photo for an action view with sound.